Type BR 125A Main lug indoor non-combination loadcentre. Maximum 16 1-inch spaces or 32 1/2-inch spaces. Single phase, 3 wire, 120/240 volts AC. Door and trim is included. Designed for your safety! 40A Spa panel ground fault protection kit - it's the best and easiest way to meet CEC requirements while saving time and money. CEC requires a ground fault circuit interrupter, of a class A type, to be installed not closer than 3 M (10 feet) to pool or spa water. Eaton Cutler-Hammer GFCI's trip on a ground fault, and may also serve as a disconnect switch to turn the pump on and off! Designed for your safety! 60A Spa panel ground fault protection kit - it's the best and easiest way to meet CEC requirements while saving time and money. CEC requires a ground fault circuit interrupter, of a class A type, to be installed not closer than 3 M (10 feet) to pool or spa water. Eaton Cutler-Hammer GFCI's trip on a ground fault, and may also serve as a disconnect switch to turn the pump on and off! The HomeLine plug-on neutral panel package combines a service entrance loadcentre with a selection of breakers including combination arc fault breakers for easy installation. The plug-on (pigtail less) combination arc fault circuit breakers connect directly to the neutral bar of the loadcentre, eliminating the need to attach a separate neutral wire to the neutral bar and resulting in faster installations. HomeLine loadcentres feature a fully distributed neutral bar that is versatile enough to accept both a pigtail and pigtail less arc fault breakers. This panel offers speed and safety features such as, straight-in wiring for the bolt-on main breaker, painted appliance white finish for no sharp edges, drywall markers for accurate installation and a shielded bus design. CSA approved to only accept Canadian HomeLine circuit breakers. 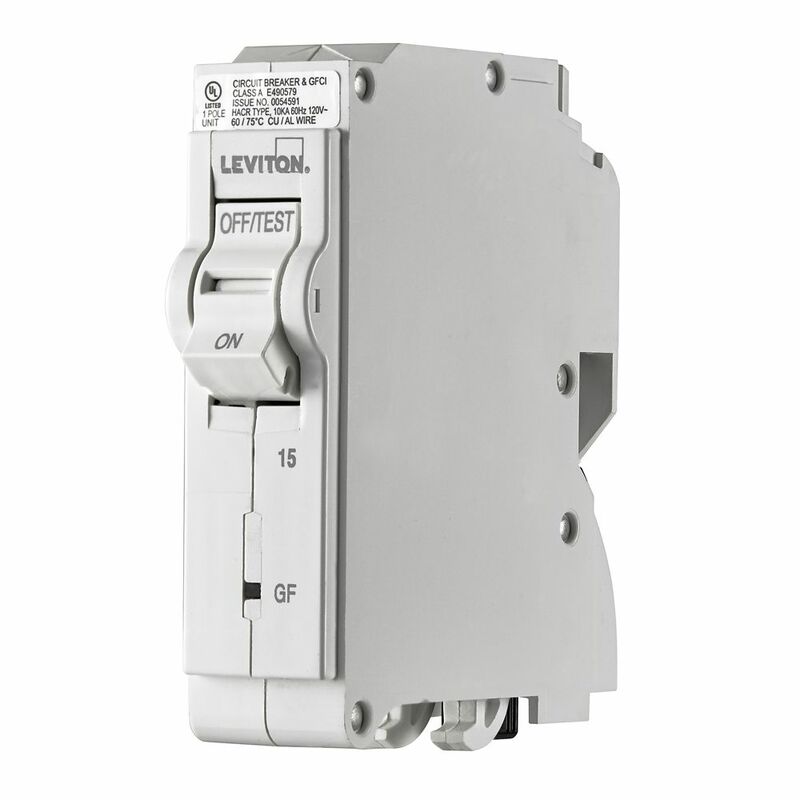 1-Pole 15A 120V GFPE Plug-on Circuit Breaker Leviton Circuit Breakers provide overload and short-circuit protection and feature an all plug-on design. All hot and neutral wires terminate at custom lugs in the panel, not at the circuit breaker, so the entire panel can be wired at rough-in without circuit breakers installed. Leaving the option of having the circuit breakers easily plugged-on at final installation. They also feature color indicators in the handle to easily see operational status at-a-glance.